The Canada Aviation Museum’s collection includes a De Havilland D.H. 100 Vampire III. In April 1945 there was a new kid on the block. The De Havilland Vampire jet, which had been test-flown as a prototype on Sept. 20, 1943, was in mass production, and soon the Royal Canadian Air Force would acquire one for winter trials at the Winter Experimental Establishment, Edmonton. As with the Meteor trials, the first Vampire flight trials were made by Squadron Leader Everett Baudoux and flight lieutenants Bill McKenzie and Jack Ritch. A typical test day was Jan. 23, 1947, when McKenzie made four brief flights involving a 50-minute VHF radio test, two fuel consumption tests at 20,000 feet, lasting 45 and 40 minutes, and a fuel consumption test at 5,000 feet, lasting 35 minutes. The trials did not go smoothly and by Feb.12 the Vampire was declared unserviceable because of problems brought on by intense cold which affected the landing gear and maintenance of proper oil temperatures. By May, however, a report concluded that the Vampire was “generally satisfactory for operations down to minus 30 C.” Below that, engine starts required prior application of heat to free the lubricating oils. Two months into the trials, while flying at 25,000 feet, the canopy of test Vampire YG372 exploded without warning. The pilot landed safely, and several theories emerged as to why the canopy failed. A major factor was that the aircraft had been exposed to bitter cold, sometimes as low as minus 43 C. The near tragedy heralded what was to be a persistent problem with the jet. The RCAF’s adoption of the Vampire as its first postwar jet fighter was bound up in politics, finance and operational considerations. Jet aircraft acquisition was tied to credits Canada had secured in Britain in complex financial adjustments at war’s end. Although the RCAF hoped to obtain Vampires and Meteors, the number of aircraft was eventually forced to fit the Procrustean bed of credits. And so the RCAF had to choose between the two fighters. Several officers preferred the Meteor because it was faster, could reach a higher ceiling and was easier to maintain. The Vampire, meanwhile, had better cockpit visibility and longer range. Its only other advantage was its cheaper price; the available credits allowed acquisition of 85 Vampires as opposed to 66 Meteors. And so, the Vampire it would be. Deliveries began in January 1948 and the aircraft remained in RCAF service until June 1956. Eventually, 10 RCAF squadrons flew it, commencing in March 1948 with two auxiliary units, namely 400 and 401 squadrons based respectively in Toronto and Montreal. This was followed in April 1948 by 402, 438 and 442 squadrons at Winnipeg, Montreal and Vancouver. The first all-jet regular force fighter unit, 410 Sqdn., was re-formed on Vampires in December 1948, and by the following spring it had formed an aerobatic team, the Blue Devils. Before moving on to fly swept-wing Sabres, many pilots in the early 1950s flew Vampires with No.1 (Fighter) Operational Training Unit at Chatham, N.B. The primary Vampire users were the RCAF’s auxiliary squadrons. Defence minister Brooke Claxton had worried about issuing jets to “weekend warrior” units, but his fears were alleviated when British and Swedish experience was cited. The auxiliary, at least until 1950, was probably more fun than the permanent force mostly because almost everybody was a friend from the last war and the training was exciting. The Korean War changed that; the permanent force regained the glamour roles, including air defence, while the auxiliary had to accept more routine and bureaucracy. Transitioning to Vampire aircraft followed a pattern. In Toronto, 400 Sqdn. had been flying Harvards since being re-formed. Conversion to the Vampire began in January 1948 with lectures directed to ground crews and dealing with maintenance. 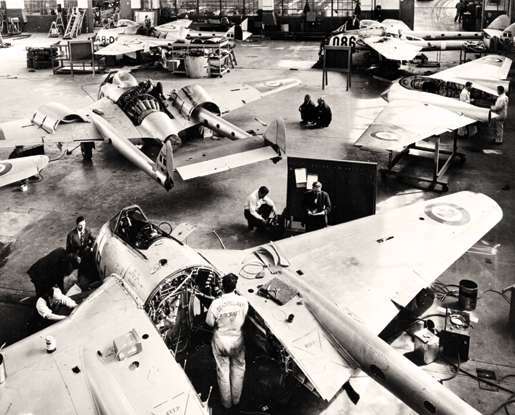 On April 1, officers attended a lecture at the De Havilland plant in nearby Downsview, and the first two pilots were checked out on the Vampire April 18, but the process was not without incident. Acquiring parts for Vampires was problematic during the late 1940s. On April 25, Flight Lieutenant Duncan Bell-Irving, a regular force officer attached to the squadron, carried out a successful forced landing on the airfield after his engine failed at 1,000 feet, just after takeoff. On Sept. 11, another pilot emerged unhurt after damaging a Vampire following his first solo flight with the aircraft. That same year the squadron attended training at Camp Borden and put on several flying exhibitions, still using its Harvards while more pilots mastered the Vampire. On Oct. 9, the unit staged its first public jet display with three aircraft flying in formation over Brampton, Ont. Auxiliary squadrons were both partners and friendly rivals. The Montreal and Toronto squadrons were particularly competitive in their Harvards or Vampires. On April 9, 1949, 400 Sqdn. boasted it had successfully intercepted four Vampires of 401 Sqdn., coming from Montreal. A typical unit, 438 Sqdn., reported that between December 1951 and May 1953, its pilots (auxiliary and attached regular force) had logged a total of 1,931 hours on Vampires and 1,181 hours on Harvards. However, the number of pilots actually trained to combat standards was low. Although roughly 75 per cent of 438’s auxiliary pilots had flown Vampires in that same period, only 50 per cent were combat trained. The report on Signpost, an exercise run by Air Defence Command from July 19-28, 1952, noted that the four participating Vampire squadrons (400, 401, 411 and 438) had only 35 combat trained pilots. The auxiliary, however, was more than just flying squadrons. Aircraft control and warning squadrons (radar units) were also manned by reserve personnel. Training strove to knit air and ground units into teams, and co-operation extended to training with army units as well. The Historical Report of 442 Sqdn., based at Vancouver, noted that on Dec. 4, 1949, the unit had conducted a defence exercise with 8th Anti-Aircraft Reserve Unit of Victoria using two Vampires and six Harvards. Also participating was a Lancaster of l23 Search and Rescue Unit. Compared to the Meteor, the Vampire’s cockpit layout was considered haphazard. When concentrating on a landing approach, it was easy to confuse the dive brake and flap levers with that for the undercarriage. Operational flying and British tests also confirmed that the aircraft type, although not prone to spinning, was erratic once a spin started, either accidentally or intentionally. The aircraft lost some 4,000 feet in the first two turns of a spin, and recovery had to be precise, lest the Vampire flick into another spin in the opposite direction. Widespread jet experience also introduced pilots to another phenomena—compressibility. At Mach .72, 72 per cent of the speed of sound, the controls began buffeting. Higher Mach numbers brought difficulties in controlling a dive. Faith in the jet was restored largely by the Royal Air Force. On July 1, 1948, six Vampire IIIs of 54 Sqdn., left Odiham for the first jet crossing of the Atlantic Ocean. Accompanied by three Mosquito aircraft, one serving as a weather scout and two providing navigational assistance, the jets were fitted with two 100-gallon drop tanks to extend their range. The aircraft went via Stornoway, Scotland, Keflavik, Iceland, Bluie West, Greenland, and Goose Bay, Labrador, which they reached on July 14. Maintenance crews, equipment and spare parts followed in three Avro York transports. From Labrador the jets flew to Montreal to commence a goodwill tour of Canada and the U.S. where they gave several formation aerobatic displays. The jets returned to Trenton Aug. 10 and by Aug. 26 were back at Odiham. Vampire safety came in for close scrutiny in 1949 when it was compared to RAF experiences. In that year, the RAF logged 22,000 hours on the type, the RCAF 5,228. In most categories the Canadians had better accident rate figures than the British. For example, RAF pilots wrote off 22 aircraft while RCAF pilots wrote off four. The RAF had 10 fatal accidents while the RCAF had three. At least three canopies disintegrated that year, and a pilot with 400 Sqdn. saw his blow off on takeoff. Three tire failures suggested that tire life was limited to 50 hours. The three fatalities were attributed to different causes. One, involving Flying Officer V.J. Bastable of 402 Sqdn., on March 27, 1949, was attributed to unfamiliarity with instrument flying. The second, involving FO J.A. Borrie of 442 Sqdn., was put down to inexperience with the aircraft. He had only four hours Vampire flying when he crashed Jan. 16, 1949. At the other end of the scale was the case of Sqdn. Ldr. R.A. Kipp of 410 Sqdn. He died July 25, 1949, while practicing aerobatics. A very experienced pilot with 36 hours on Vampires, his death was attributed to overconfidence. Meanwhile, the canopy problem did not go away. During the winter of 1950-51, 400 Sqdn. made 14 high altitude flights using an experimental canopy installed by De Havilland (Canada). Authorities were not impressed, and in January 1951 the Institute of Aviation Medicine cautioned against flights in excess of 38,000 feet without a modified oxygen system. The RCAF also encountered problems in acquiring parts for their Vampires, particularly in 1948-49. These problems caused many embarrassments. On Nov. 14, 1948, 400 Sqdn. reported that only one aircraft was serviceable, and an interception exercise had to be performed using Harvards. On April 10, 1949, the same unit had to cancel another interception “scheme” when all but one of its Vampires went unserviceable during engine starts. More mundane, but equally frustrating, was an incident July 2, 1949, when two Vampire airspeed indicators failed in flight, forcing them to land early and away from base. The following day, all of 400 Squadron’s Vampires were grounded for inspections which lasted until July 6. General serviceability improved as all personnel became more familiar with the type. Although later Vampire models carried bombs and rockets, the RCAF’s Mark III aircraft were never so equipped. In two instances auxiliary Vampire squadrons were subsequently re-equipped with Mustangs, better adapted to tactical air support roles for which the reserve units came to be cast. In 1948, consideration was given at Rivers, Man., to adapting Vampires to a tactical reconnaissance role, but they did not prove amenable to camera installation. As the Vampires aged, questions were posed about what to do with them. Should they be given to allies as Mutual Aid contributions or converted into two-seater trainers? Few buyers could be found, and the purchase of T-33 training aircraft made greater sense than reconfiguring the jets. Of the 85 RCAF Vampires acquired in 1947-48, 25 were written off in crashes. Others were discarded after lesser accidents. Only 40 survived until withdrawn from service in 1956, although they remained on inventory until 1958. Air historian Larry Milberry, in Volume III of Canada’s Air Force at War and Peace, wrote of many “languishing in the weeds at Malton, [Ont.,] where the kids used to wander among them, inspecting the cockpits and watching the paint and plywood peel.” They were eventually sold off to private firms; 15 former RCAF Vampires, through a commercial middleman, ended up in the Mexican Air Force. At least six Vampires survive in various Canadian museums. The story of the RCAF’s association with the Vampire would be incomplete without reference to 421 Squadron’s unique experiences. Equipped with Vampire IIIs in September 1949, the unit was selected for a rotational tour in Britain. Personnel were flown to the U.K. in January 1951 and took up residence at Station Odiham. 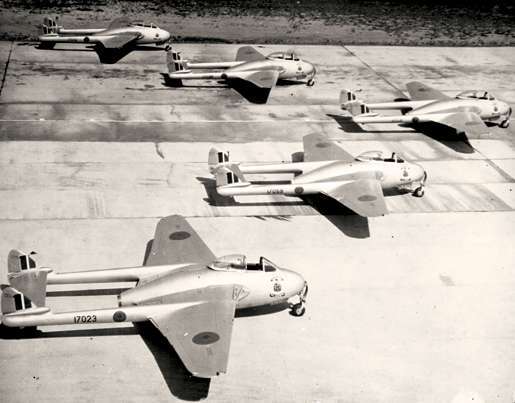 There they were issued 16 Vampire Vs and two, two-seater Meteor VIIs from RAF stocks. They were to train with two RAF squadrons, learning current operational techniques. The squadron’s pilots commenced their overseas flying Jan. 30, 1951. Training was delayed by shortages of parachutes, but by Feb. 22 they reported flying 52 hours 30 minutes in a day. Thereafter, they flew on numerous exercises. At dawn on March 14, 1951, they began dispatching Vampires as part of a scheme which envisaged two British warships sailing up the English Channel and being “attacked” by USAF B-29s. The squadron, in turn, was to provide fighter protection. “Many interceptions were made and much good experience was gained in attacks on heavy aircraft,” read the unit’s historical report. On March 19, 1951, the squadron commenced air-to-ground firing exercises. The Vampire V, unlike the RCAF’s Mark IIIs, was fully equipped for tactical air support. After handing its issued aircraft back to the RAF in November 1951, the squadron prepared to return to Canada. However, many of its personnel transferred to 410 Sqdn., which had now taken up residency in Britain as a prelude to the formation of No.1 Air Division in Europe. Back in Canada, 421 Sqdn. became a Sabre outfit and moved overseas again in 1953 to join No.1 Air Division.